August 14 mudslide killed hundreds and left thousands homeless. Freetown — The death toll following devastating mudslides and floods in Sierra Leone has doubled to over 1 000. The tragedy occurred slightly a fortnight ago, coming shortly after the Ebola virus hit the West African country alongside Guinea and Liberia. The disease claimed some 14 000 lives by January last year. 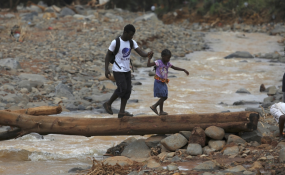 Initially, Sierra Leone's government reported over 450 people had died from mudslides and floods, with victims largely those living in informal settlements. Henry Neondo, spokesperson of the aid group, HelpAge International, said with hundreds of people still uncounted for, the death toll was expected to rise substantially. He said research indicated older persons and those with disabilities were at greater risk of injury and harm due to mobility challenges. "They are less likely to flee due to hardships associated with travel and a reluctance to leave home, land and possessions," Neondo said. The spread of diseases such as cholera, typhoid and diarrhoea following flooding is also a huge concern particularly in the capital Freetown. "The city's drainage system got badly damaged by the torrential rains, leaving stagnant water in most areas," said Alex Carle, director of international programmes at the Red Cross. President Ernest Bai Koroma said the devastation was overwhelming. He appealed for urgent help to support the thousands of people affected by the mudslide. Humanitarian groups said as the country entered the recovery phase it would need assistance to help affected people back on their feet.